As we become older it becomes more and more important to take the proper steps towards maintaining our health. This is because our health will begin to decline with age and thus it is vital to slow this decline as much as we can. 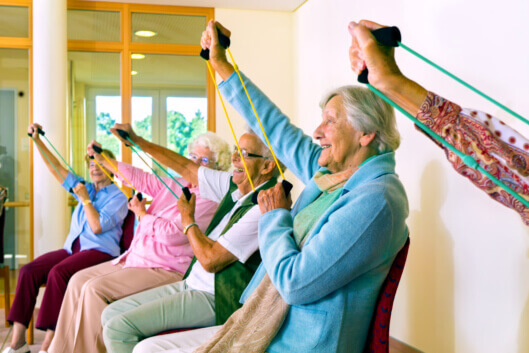 There are many different ways we can do this such as exercising, eating right, or even getting assistance from providing home care services in West Hartford, Connecticut. At first, it can be tiring or even exhausting to exercise, especially if you are not used to physical activity on a regular basis. However, the more you exercise, the easier it will get. You may even begin to notice that you have more energy throughout the day. This means you are getting stronger and that your body is able to use your energy more efficiently, which can make it easier for you to live the lifestyle you love. It is very important to find ways to maintain your weight at an advanced age. This is because the older we become, the easier it will get to gain weight due to a reduced metabolism and other factors. By exercising, you will be able to improve your metabolism, burn calories, and stay fit. Exercising may seem like a chore at first but once you get into a routine, it can really improve your life. Not only will you feel healthier, but you will also feel happier. When you exercise, your body will be filled with endorphins that are responsible for improving moods. This is definitely a great way to prevent depression or to simply bring yourself back up if you are feeling down. Our personal care assistant in Connecticut can also help you. Those are just a few of the many reasons why exercise is so important for senior citizens. If you are looking for a great way to improve your health and maintain your youth, you cannot go wrong with regular physical activity. Find out more about our exceptional homemaker services in Connecticut. Contact us to get in touch with our staff At-Home Care Services today. This entry was posted in Exercise and tagged A Happier Life, Boost in Energy, Healthier Weight. Bookmark the permalink.